"The Guru is everything," writes Shri Babaji in His commentary on the Guru Geeta. In this devotionally charged exposition of the power of the Guru-disciple relationship, Babaji explains the requirements of a disciple in terms of humility and total devotion to the Guru, the need for and role of the Guru, and the qualities of a Realized Jnaani Guru and His glorious Existence as That Ultimate Truth, the Self. The idea for this commentary arose spontaneously from a request by a devotee. Commenting on each of the 352 verses, Babaji conveys what He learned from the Divine Guru, Swamiji, through close observation of His behavior, His deeply profound teachings and unfathomable Silence. The mind is slippery and is always wandering in this world like a monkey. The Guru initiates the disciple into the proper technique of sadhana and lights the way on the spiritual path like a torchbearer, inspiring the disciple to put in efforts. 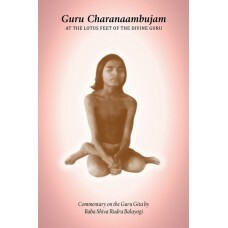 The title 'Guru Charanaambujam' means the 'Lotus Feet of the Guru.' This means that if one is receptive and adopts the spiritual methods set out in the Guru Geeta, the Guru Geeta can become like the physical presence of the Guru, ready to guide and inspire at all times. It can become like the Lotus Feet of the Guru where all achievements of the disciple, including Liberation, are laid as an offering. As such, 'Guru Charanaambujam' also signifies that Babaji offers this commentary at the Lotus Feet of His Divine Guru, Swamiji, from whom He gained this Knowledge.